The first time I visited Tent City, I wasn’t sure what to expect. 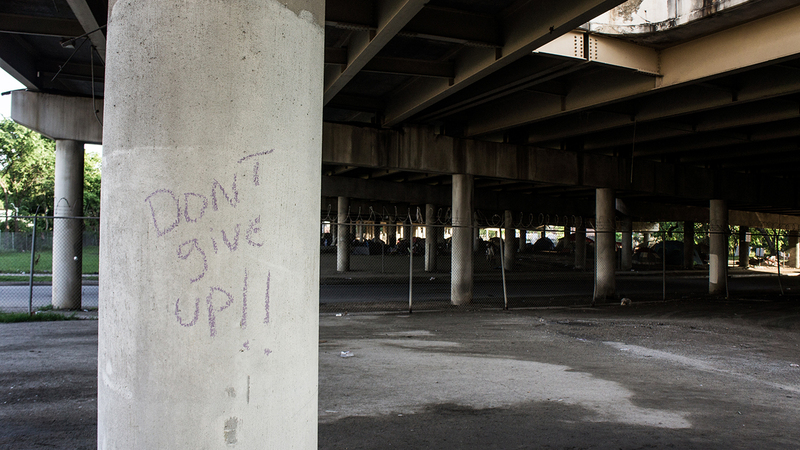 It was 2016, and the homeless encampment under Interstate 45 had grown so large that it was divided into sections, A through E. There was even a “convenience store” in one area and portable toilets to serve about 300 people. On weekends, charitable groups handed out food, supplies, and clothes. But a string of violence prompted City Hall to shut it down. 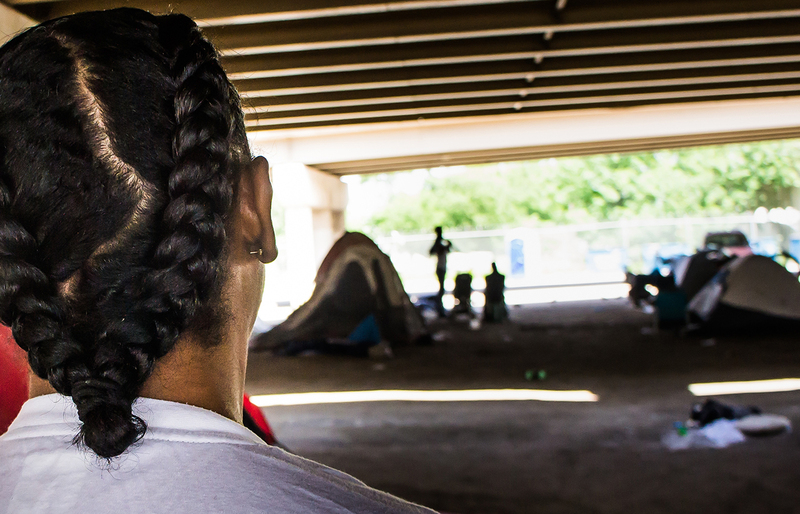 There was never a clear plan as to what would happen to the people who called Tent City home. Several organizations worked with folks to find them housing. But many of the homeless simply moved to a new encampment. I live downtown. Generally, when I walk out my door, the first person I see is homeless. He sleeps on the grate in front of my apartment building. We exchange pleasantries. Often, my interactions with the homeless are about my dogs, which I find to be great icebreakers, not only with the homeless but also tourists, kids, adults, everyone enjoying our vibrant downtown neighborhood. When news spread about Tent City closing, a few neighbors and I decided to help tell the stories of those losing their homes. 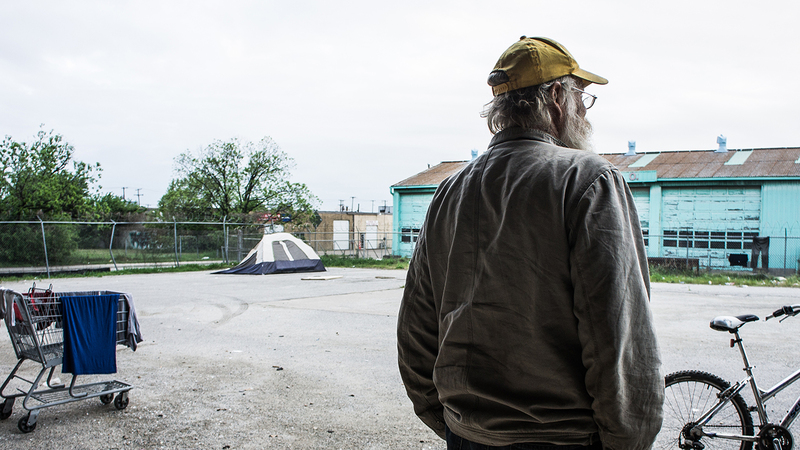 We believed that Tent City, for better or worse, truly was home to many. As our group started walking in Tent City, we were nervous. We were encroaching on people’s front yards. We were timidly making our way through the sections when a group of guys by a fire pit waved us over. We’re making dinner, they told us. Want to join? We looked at each other, shrugged and joined them for dinner, which was a stir-fry. One of the chefs, Yasef, was a tall guy with clothes way too small. He looked beat down. He wouldn’t smile for our camera. He said there was nothing to smile about. We interviewed a few other tenants, and then we left. Two weeks later, we returned. And Yasef was there. “I got an apartment!” he said, flashing us a huge grin. “It’s furnished and has a TV!” He told us he had moved a week ago. For many, home is a structure. It has a certain number of rooms, a bathroom or two. Maybe it’s a condo downtown or a ranch home on acreage. 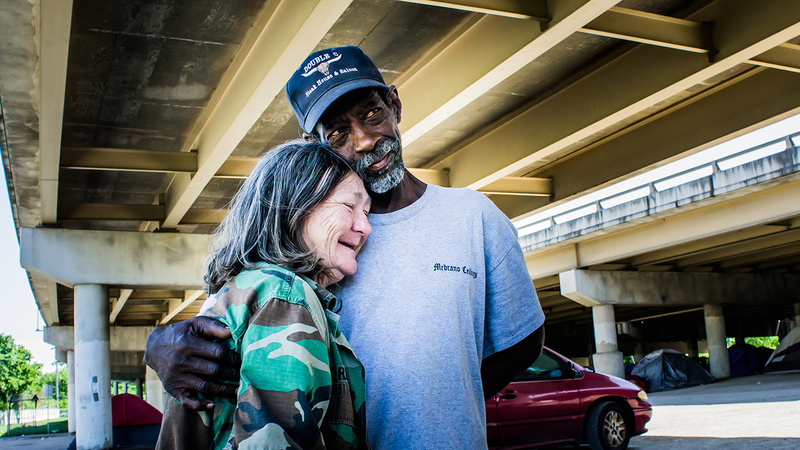 And yet for many in Dallas, home is on the streets, or under an overpass, or on a cot in a shelter. If you ask what home means to this group in our community, the answers are as varied as the options. 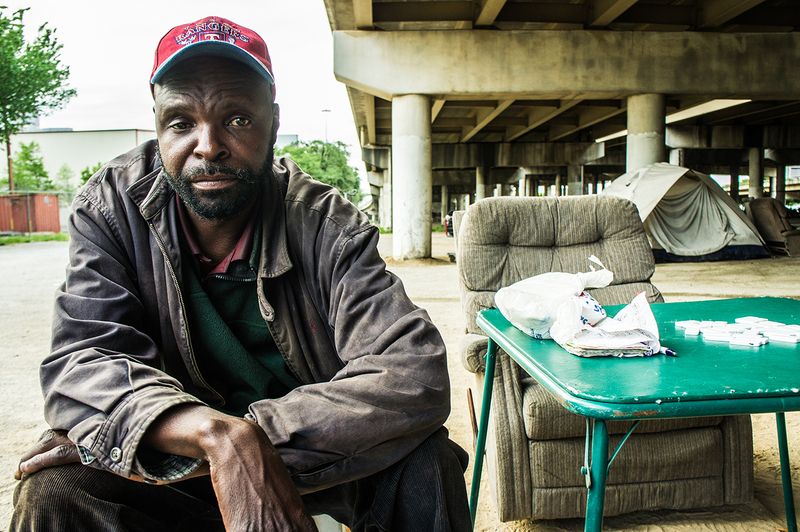 He feels they set him on the road that led to the Bridge Homeless Recovery Center in downtown Dallas. Two reasons he appreciates the Bridge so much: It has services for veterans that he uses, and it allows Cujo to stay with him. The little spotted dog is 12, and he’s had cancer for about five years, Ron said. Calm for a Jack Russell, he is content to lie at Ron’s feet and catch a quick nap. The Bridge has a kennel for dogs, something most shelters don’t provide. But Cujo gets to stay in Ron’s transitional housing space because he’s a service dog. “He’s detected my blackouts, my seizures, and he’s helped me with my PTSD,” Ron said. Ron even credits him for being the force that separated him from his brother the night of their fight. It’s been two years since the first Tent City closed. Since then, a Dallas Commission on Homelessness was created (full disclosure: I was on this commission), a restructuring of various departments in City Hall occurred, a permanent homeless commission was put in place, and a new housing policy was introduced. 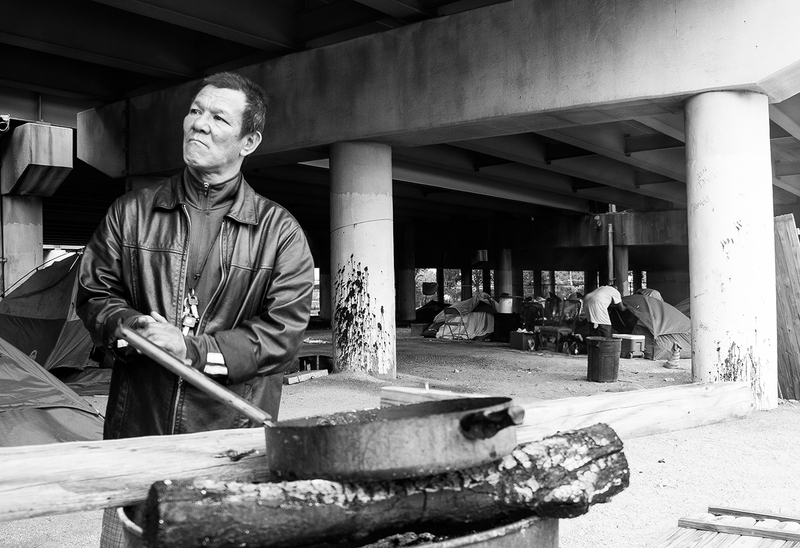 There have been several changes in leadership in the various homeless services. “This is a challenging conversation because the simple answer is: Things have gotten worse,” said Sam Merten, chief operating officer at the Bridge. 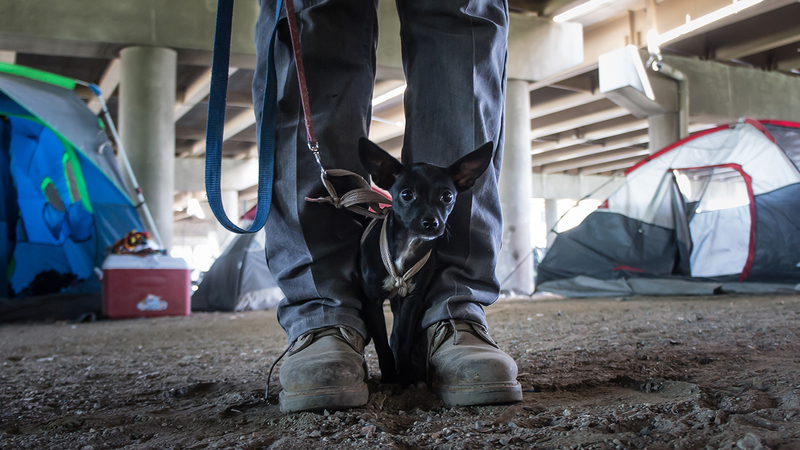 Since the first Tent City shut down, he said, the poverty rate in Dallas has increased but funding for homelessness has not. Russell Stonecypher knows this well. His mom owned a beautiful home in Oak Cliff. When she died, she left it to him. But he couldn't afford the taxes, and after only a month, he had to sell the home. He had been on the street for about two weeks when we talked to him in May. He spends most of his time reading at Main Street Garden downtown. He's working his way through George Jones' autobiography. “He's a talker,” Russell said as he sat on the deck at Main Street Garden. “What do I consider home? Right now, it means this,” he said as he swept his arm around the park. There's a full moon over the flashing PARK sign on the edge of the greenspace. 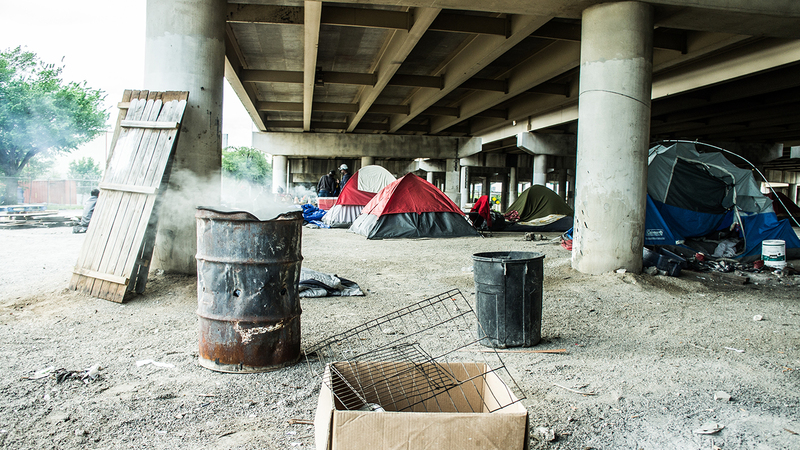 In the March 2018 homeless count by the Dallas Metro Homeless Alliance, the number of unsheltered homeless increased 23 percent from 2017. When my neighbors and I began visiting Tent City in 2016, we ran into many people who hoped to find a home before it closed. They had vouchers. They were just waiting for a place to accept them. Brenda was one such person. 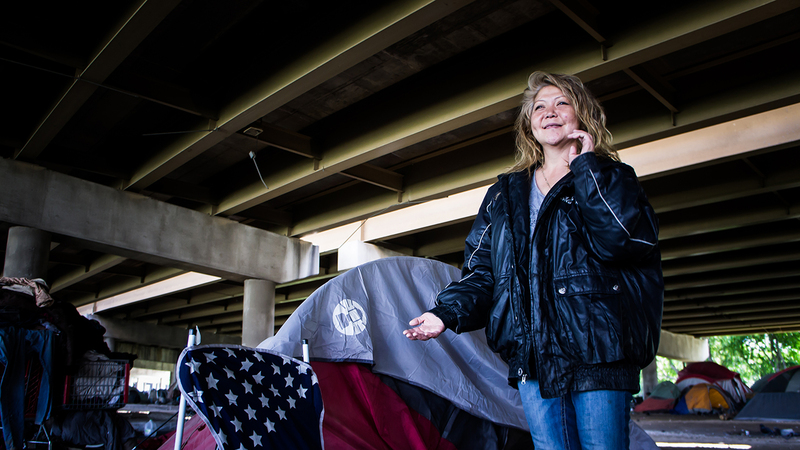 She greeted us with a huge smile and a big hug as the clock ticked on Tent City. We lost track of her after that. But she showed the determination it takes to get off the streets. It’s not just having a desire to find a home, but also finding the place that will accept a voucher. Because of this, people create home wherever they can with whatever they can. And that, to him, is home. 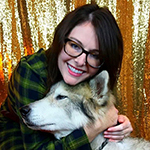 Krista Nightengale is managing director of the Better Block Foundation.